Last week I told the story of how I started my side business. It was quite interesting to read and respond to all of the comments. Lots of people were interested in starting a business or were looking to expand their current side business. The solution for most of these people was something I learned early on in my online business journey – the power of outsourcing. When I first started my online business, I was lucky enough to have most of the skills required to get it all going. The areas where I wasn’t as strong, I got by learning as I went. As a result, I was working like a madman trying to do everything myself. I felt liberated that I could handle it all while spending very little. Little did I know, this is what was holding me back and limiting the growth of my business. Sometimes your pride is your biggest obstacle. It rewards you when you can do everything independently and shuts you out of asking others for help. Price assumptions can play a role too. When you’ve never outsourced help before, you may assume that you have to hire people for a regular time commitment or that they all charge high hourly rates. That’s just not true. You can hire people for as many or as few hours as your require and the prices are very competitive. Some people just have a ‘spend as little as possible’ mentality when starting their business. When you’re trying to make money, who would pay someone to do tasks that they could technically do themselves? A smart business owner does! Now I don’t recommend going and outsourcing every single task related to your online business or businesses. You might have the cash to do that, but there are a lot of benefits to knowing more about all the different tasks associated with your business. Nor should you try to master every task for that matter. It is quite helpful to have at least a good understanding of any regular tasks though. This can help ensure you are not getting overcharged when you do outsource. Plus it will help if you ever get in a bind. You may be able to take over those tasks or be able to better pass it on to someone else. Also you just get more respect when you can talk to contractors or associates with in-depth knowledge. Content Writing: articles for my own websites, articles for marketing and press releases. Marketing: article distribution, blog comments, forum posts and directory submission. Website Design: logo design, full website designs and blog themes. Web Programming: bug fixes, new website features and entire websites. Even with this basic list you can begin to see the vast assortment of jobs that freelancers can help out with. There are many different websites and forums to find someone to hire. It comes down to how much you are willing to pay, skills required and time commitment. Elance – This is where I turn to when I need high quality help. Mostly I use it for hiring writers where English skills are particularly important. oDesk – When you’re on a tight budget this is a great place to find quality help such as programmers and virtual assistants. This site is dominated by overseas freelancers though. So it’s probably not the best place to hire anyone for writing jobs. Digital Point Forums – I often turn to this forum for help with small programming fixes, but you can find all kinds of help on forums like this. You just have to be a lot more careful as an anonymous forum is open to abuse. Craigslist – I’ve only hired people through Craigslist a few times, but I have found plenty of full time jobs via their classifieds. Primarily you’d want to use this when you require a local freelancer and are willing to pay a bit more money. 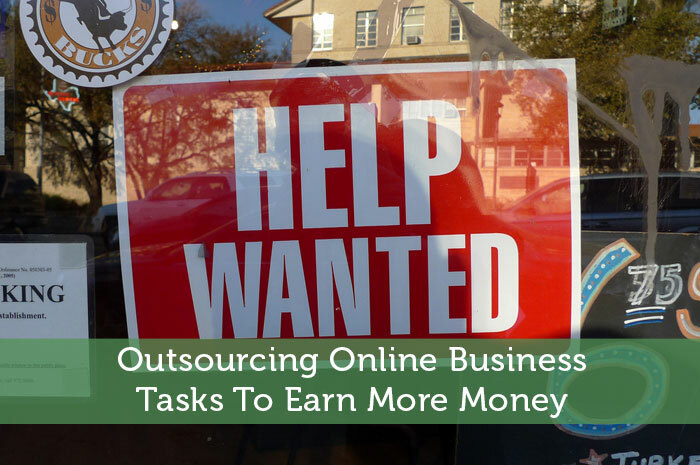 So that about covers the basics of outsourcing online business tasks. Stay tuned for future posts about outsourcing and how you can start your own business. You can subscribe to my rss feed to learn more. What about you? Do you outsource any service for some of your business tasks? Or is it something that you plan on doing once your business gets more profitable? Leave a comment below to share your story. Or feel free to e-mail me if you have any private questions. These are some great resources. I definitely fall under the category of spending as little as possible on my side venture. But the advantages of outsourcing couldn’t be clearer: it allows you to focus on what you do best and saves you valuable time. Yes and time is money. Sometimes people just need a little reminder about outsourcing in order to make the move. They may recognize its value, but it’s still only natural to try to put it off as long as possible. This just delays the growth of their business though. Jeremy I have used Odesk before and found it worked out very well. I would recommend them. You can post the job you want and about 10-15 people apply for your job. It is great when you want something done on the CHEAP! 10-15 people? I guess the jobs you posted were more specialized. I recall getting dozens of applications for each project. It really added a lot of work to go through them all and narrow it down to who really was qualified. The prices were always rock bottom though. Thanks for the insight. I could definitely use to outsource some things. It is so hard to find someone you trust though and that does good work. Taking time to pick the right person is huge. I definitely agree. Taking the time to hire someone trustworthy is the most important part. There are plenty of freelancers who will take shortcuts and do sub-par work. It is up to you to really go through their previous project feedback ratings and ask necessary questions. Even then, you have to stay on top of their work early on to ensure they are the right person for the project long term. I haven’t started outsourcing yet, but I’m starting to see the benefits to doing it. I’m getting more and more overwhelmed with doing everything myself (as much as I do enjoy it) but there’s only so much time in one day. Thanks for the tips! I’m definitely going to consider outsourcing a few tasks, just to start. Carrie, definitely jump into it soon. I noticed you announced getting a new job. So now might be a great chance to free up some of your time. Really examine all your daily tasks that go into running your business. Think about what tasks are most important and which ones you feel it is best to handle yourself. Shoot me an e-mail if you have any questions about getting started with outsourcing. Perhaps you can even convince your employer to take advantage of outsourcing within your new job. I know I also do this at all of my marketing jobs. I have used Fiverr in the past to hire someone to create an eBook cover. I thought they did a great job. I also hired someone to fix a photo and remove a background and that would have taken me more than 2 hours to complete (understanding time/value of money I hired someone for this job). For simple tasks, I really recommend that website – not a lot of money invested. I’ve always wanted to give fiverr a try, but I could never find any projects where I felt it was only worth $5. If the project is small enough, I’m sure it is a good option. The problem is when you try to hire for a larger project through there. Then you really only get our $5 worth. I have outsourced copy writing before, which can be hit or miss. Sometimes I am really busy with my full time job and just can’t be bothered with writing articles and posts for my websites. I don’t really consider myself lazy, more like using all the resources at my disposal. Why should I sit and write something that would take me an hour when I could pay someone $5-$10 to do the same thing when I can make more than that in the same amount of time. That’s how I feel about it too Mike. Sure I could do these tasks myself, but for the time it would take compared to how little they charge, it’s just not worth doing myself. As for hit or miss writers, that is why I tend to stick with writers for months at a time once I find someone good. I can be quite picky about the kind of work I accept. I eventually hope I can find a person (or two) to outsource more things to. I currently use somebody to help with my carnival submissions but I would LOVE to find somebody that would do the blog comments for me. I enjoy that parts other than the fact that it takes up an enormous amount of time. Hiring someone for blog comments is a bit tricky. I’ve dealt with various people who offer this kind of service and far too often it was the drive-by type of commenting. It would be obvious that they didn’t read the whole post and they were just rushing it. It’s not the kind of commenting that really builds relationships and gets people to click through to your site. You could get them to handle specific sites where it is less about building the relationship. Or maybe there are some other tasks that could free up your own time for more blog commenting. We’ll discuss this more via e-mail Jason. I’ve looked into the blog comment services as well. But after thinking about it, they don’t know my views on certain topics. And, I was hesitant based on what Jeremy said, that they are more just fly-by comments as opposed to comments with substance. For sure, you wouldn’t be able to rely on them to convey your views on things. Their comments are going to be in their voice with their views of things. You’d really have to watch how they are representing your blog. If they do their job poorly, it could cause more harm than good. Thanks for stopping by my blog Pete. Outsourcing earlier is one thing I would change if I did it all over again too. Learning some things can be very beneficial though. You probably didn’t need to learn css, but it must come in handy now when writing a blog post and needing to do a bit of formatting. And if you do outsource that kind of work now, you have a much better idea of how long it should take them and what a reasonable cost is. I haven’t wanted to outsource anything just yet (don’t want to spend the money right now) but I have heard great things about all of those sites – especially oDesk. Sounds like a great alternative when you have pieces to outsource! Yeah considering your blog is less than 2 months old, you might need to rush into outsourcing just yet. A blog can take much longer to build up than a niche website or other kind of online business. So for now focus on building it up as much as you can yourself. When you notice some momentum picking up, maybe reconsider things like paying for a header design or outsourcing some regular tasks. Wow – I definitely need to outsource some of my blog activities so I can continue to grow it without sacrificing too much of my other goals… I did outsource migrating from blogger to wordpress, which is a good first step. Sounds like you’re on your way to accepting outsourcing. Next step is getting the new logo from your designer friend. There is a lot of work involved with running a blog. So if we can find ways to free up our time, we can be even more productive. It does sound like your blog is affecting your progress on other goals. You can also be using outsourcing for the other online business you were thinking of launching. Perhaps it’s a better candidate for outsourcing where less personal attention is required. Very good and very helpful. Outsourcing is needed for growth and overall sanity once you start to really grow. For sure, outsourcing does play a parting in keeping us sane when running a business. It’s not very healthy to constantly be overworking yourself. At some point you need to accept that you may need help in some areas. I didn’t even know outsourcing was an option (or popular) until I read “The 4 Hour Workweek”. I am one of the people with the problem of trying to do everything myself. About two months ago I finally outsourced my marketing / advertising to Crystal at Budgeting in the Fun Stuff. I wish I had outsourced my website design too – I’d probably have a way cooler layout. Great example of a good task to outsource. In that case there are even more advantages to paying someone else to do it. In the case of hiring an advertising broker, they can take advantage of all their existing contacts and their ad negotiating experience. On your own, you likely wouldn’t ever hear from most of those advertisers and you’d probably settle for a much lower price. It’s not too late to outsource your web design. Sites are always changing their designs. Some people start with a very basic design and later upgrade when they want to take things to the next level. I don’t think I’m even close to the point of outsourcing yet. But I see the importance for larger time consuming online businesses to do so. Well keep it in mind for when your business does gain some momentum. With some businesses you don’t want to outsource until you are positive it can be profitable enough. Before then it can be tough to gauge how much you can afford t spend on outsourcing. Those are really great tips. You know I’ve written about outsourcing, and I currently do for several tasks. I would also suggest looking at the Yakezie Blogger Services, where there are a lot of bloggers that offer services! Good tip about the Yakezie Blogger Services. If your online business is a blog too, it makes sense to hire people with blog marketing/management experience. They will have a much better idea of what you need done and how. Fiverr, Odesk and Elance are my favorite tools to outsource work. For everybody new to this: just know that it takes trial and error to find the people who will work well with you. There are also people out there who just try to get your money for a little effort as possible (especially when you pay peanuts). Thus only expect what you inspect. I definitely agree that outsourcing can be a bit of trial and error. There is a lot of trust involved and many people attempt to abuse that trust. They think that since you cannot physically see them working, they can over-quote hours or do things half-assed. Sometimes it can take trying a few different people before you find someone who can meet your expectations. In some of those cases it may be best to figure out some kind of performance based contract or one where you are paying a flat rate for specific tasks. If there is a way to outsource commenting on other sites it would be a great way to increase site readership. I know a few service providers who do this but they charge as per no. of comments. Unfortunately blog commenting is a tough task to properly outsource. For the price people are charging and the actual benefit you get from each comment, usually it does not make sense financially. Well that’s true in the early months of an online business. Once it gets more profitable, it becomes more feasible. For some it might make sense to actually take on a marketing partner instead. I’ve started to outsource some of my duties related to blogging. It was hard at first, only because I let my pride get in the way….why hire someone when I can do it myself? The reason: time. Freeing up time on some of the more manual aspects allow me to focus more on areas that can help me drive growth. I’d be interested to hear what kinds of tasks you’ve decided to outsource. The other part that I struggle with is that I like to keep a lot of variety. So I like to take a break from one task to focus on something completely different. If I outsource too many of those tasks, I end up having a rather monotonous routine. I usually try to do things on my own if it’s something I think I can tackle. This helps me expand my skills, and also understand what needs to be done if I decide to outsource the task. That said, I’ve become better at recognizing my own strengths and weaknesses, and I’m more willing to outsource certain tasks right away without trying it myself. That sounds like a good balance. Some things just aren’t worth outsourcing. The part about recognizing your own strength and weaknesses is huge. Once you can accept that, you can truly excel with your strengths and waste less time pursuing areas where you are weaker. In the past I’ve made the mistake of trying to do everything myself and it led to a lot of frustration and wasted time. Finding someone reliable can be tough though..especially writers. I tried finding someone cheap on Odesk to work on some small niche sites but had very bad luck. I need to try out elance or a few others. Writing can be a tough area to outsource. When you go cheap, the quality almost always reflects that. So if you want good quality, you need to pay a bit more and stick with any good writers you come across. User reviews help with choosing someone, but you also want to read some sample writing. I must admit that I am guilty of trying to do everything myself, but I am trying to get into the habit of outsourcing more. If you are short of cash you can also use Fiverr to outsource some jobs. Everthing is only $5, so obviously there is a limit to what can be done. However it is surprising how much you can get for your $5. I’ve had very professional sounding 3 minute voice overs for just $5 for example. That is only natural early on Jon. At some point to expand you usually need to look into some type of outsourcing. Just keep in mind how valuable your time is and what else you could be doing with your business in that extra time. It sounds like I should giver fiverr another chance. I had been somewhat prejudiced against it assuming that it would be mostly low quality work. $5 for a good voice over sounds like a steal though. I have started doing this with freelancer.com, had the same experience as with odesk. tons of people apply for projects and becomes very difficult to shortlist. I guess in some cases it may be best to outsource from the smaller sites that specialize in a specific type of work such as writing or programming. If the whole hiring process and correspondence takes too much time and effort, it can negate a lot of the benefits of outsourcing in the first place. I’ve been into outsourcing and recently I’ve hired a virtual assistant from Staff.com. Working with a virtual assistant is a great way to save time and improve efficiency. Virtual assistants are flexible and can provide professional administrative, technical and social assistance to clients. One thing that I realize when hiring, you must screen independent contractors first before hiring. It can help you determine the right person for the job. I am now thinking to outsource several task for my online business. Yes, it saves my valuable time and I am able to improve my productivity at the same time. Thanks for this great open-mind article. Seriously.